Shah Farms Resort:An enduring classic is the first thought that enters your mind as you roll into the gates of “Shah Farms” – it transcends you to the great European Era. The Grand Venue blends beauty, luxury, ethnic architecture and grandiosity under one roof. Shah Farms displays a marvel of European Architecture with Modern interiors. It has a modern decor & lavishly adorned crystal chandeliers that lights up the ballroom creating a world class ambience. One of the biggest centrally air-conditioned halls in the tri-city. Modern interiors with green plants and water features to create a world class ambience. Classic Furniture with high back chairs. Luxury suite for bride with special photography studio. If planned well in advance a dress code can be established in keeping with the theme. This will make your wedding different and something to be talked about. 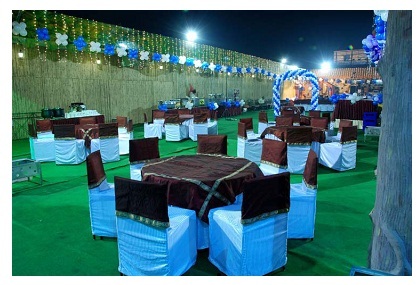 This entails transforming the venue, be it the interiors of a hotel, a banquet hall or a mega sized farm house into one that fits with the theme .